Home > Popular Scams > What Are Phantom Flat Transfers? It sounded like a fantastic flat. “Mary” read about it in her local newspaper, and was impressed by the bright, airy bedroom and modern kitchen. Plus, the price was perfect – in fact, a lot less than similar flats in the area. But when Mary rang the phone number to arrange a viewing, the “landlord” told her he was fed up with time-wasters. So fed up, in fact, that she would have to transfer the first two months’ rent to a friend first to prove she was financially viable, before he’d show her the flat. Mary was so certain she’d want the flat that she agreed, only to find out later – much later – that the flat didn’t really exist. It was a phantom flat, and the whole advertisement and subsequent phone call was simply a ruse for the criminals' to get their hands on her money. Once she had transferred the money to a friend, she gave the landlord the receipt. When she went to get the money back, it had mysteriously already been collected – by someone else. Welcome to the world of phantom flat money transfer scams. Phantom flat money transfer scams are easy ways to con people, because they are so easy. In fact, you don’t even have to own a flat to make this scam work; all you have to do is post nice photos of one on a property lettings website or craigslist. At the moment, anyone who has the transfer number can go and collect the money, which is one reason why this scam is so easy to perpetrate on unsuspecting victims. It shouldn’t be that easy to steal the identity of someone, but it is. Citizens Advice has warned people to be on the look-out for such scams, saying that people should never transfer money to individuals they don’t know. It is trying to work closely with money transfer companies to help them improve their services, so that criminals taking advantage of their services can be tracked down. Citizens Advice cites several examples of phantom flat transfers being successfully carried out, and say that in each case the police were unable to do anything as the victims were unable to provide information about who had collected the money. In one case, according to Citizens Advice, the money transfer agency assured the victim beforehand that photo identification would be required were someone to ask for the money. Sadly, that wasn’t what happened, and the money was lost. Equifax mentions another case in which a student was left £1,800 out of pocket after she fell for a phantom flat scam. Because she had to fork out so much money, she was also left without the prospect of finding a decent place to live. The reason so many people fall for this scam is because they don’t look behind the fine print. They assume that if they simply transfer funds to a friend, they’re safe. Nothing could be further from the truth. Transferring money using a money transfer company is a bit different than transferring funds from one bank to another. To put it simply, the safety mechanisms are not fully in place, and consumers have little or no protection. Perform a check through the Land Registry to see if the “landlord” really owns the building in question. 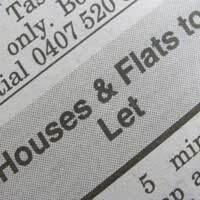 Only use a reputable lettings agent to look at flats. You might think you could get a cheaper deal elsewhere, but once stung, twice shy. Don’t agree to rent a flat or show funds until you’ve actually seen it – and either met the landlord or the lettings agent in person. It’s always a good idea to view a flat in the company of a friend, not on your own. Keep in mind that no legitimate landlord should ask you to supply proof of funds. If they want to make sure that you are good for the cash, they can do what other respectable flat owners do: run a credit check on potential tenants, and/or ask for references. If a landlord does ask for cash before you’ve even seen the flat, you can rest assured that this deal is a dodgy one. Run the other way – as fast as you can. You don’t want someone who has stolen your identity showing up at a money transfer company and getting hold of your money.